Loiter, PosHold and AltHold modes also support terrain following. Please refer to the terrain following for non-autonomous modes wiki page. Using a recent version of Mission Planner (or other GCS that supports terrain following) on the Flight Plan screen, set the altitude type to “Terrain”. Once set all mission commands that include an “Alt” fields will be interpreted as altitudes-above-terrain. Do not set the EK2_ALT_SOURCE or EK3_ALT_SOURCE parameters. These parameters should be left at “0” (barometer). Do not set the EK2_RNG_USE_HGT or EK3_RNG_USE_HGT parameters. These parameters should be left at “-1”. 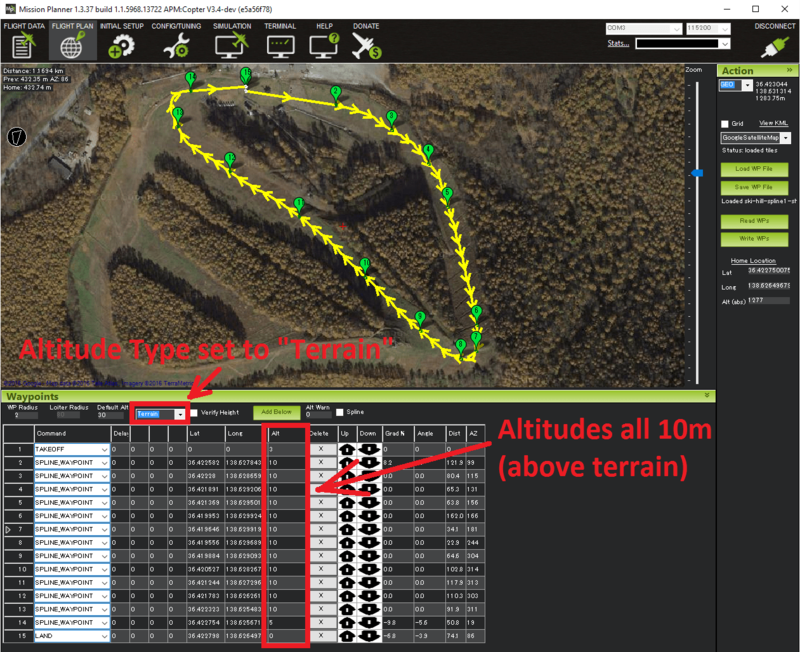 Set the TERRAIN_FOLLOW parameter to 1 to enable using terrain data in RTL and Land flight modes. If set the vehicle will interpret the RTL_ALT as an altitude-above-terrain meaning it will generally climb over hills on it’s return path to home. Similarly Land will slow to the LAND_SPEED (normally 50cm/s) when it is 10m above the terrain (instead of 10m above home). Currently setting this parameter is not recommended because of the edge case mentioned below involving the somewhat unlikely situation in which the vehicle is unable to retrieve terrain data during the RTL. In these cases the RTL_ALT will be interpreted as an alt-above home. If the vehicle is executing a mission command that requires terrain data but it is unable to retrieve terrain data for two seconds (normally because the range finder fails, goes out of range or the Ground Station is unable to provide terrain data) the vehicle will switch to RTL mode (if it is flying) or disarm (if it is landed). Note that because it does not immediately have access to terrain data in this situation it will perform a normal RTL interpreting the RTL_ALT as an altitude-above-home regardless of whether TERRAIN_FOLLOW has been set to “1” or not. One common problem reported by users is the vehicle immediately disarms when the user switches to AUTO mode to start a mission while the vehicle is on the ground. The cause is the altitude reported by the range finder (which can be checked from the MP’s Flight Data screen’s Status tab’s sonar_range field) is shorter than the RNGFND_MIN_CM parameter which means the range finder reports “unhealthy” when on the ground. The solution is to reduce the RNGFND_MIN_CM value (to perhaps “5”). The TERRAIN_SPACING parameter controls the size of the grid used when requesting terrain altitude from the Ground Station (it is not used if using a Lidar). This is 100m by default but reducing to 30 may provide better accuracy at the expense of more telemetry traffic between the GCS and Flight controller. It is recommended that you use a TERRAIN_SPACING of at least 30 meters. The accuracy of the SRTM database varies over the surface of the earth. Typical accuracy is around 10m but one developer noticed an inaccuracy of 35m at the peak of a skihill. This makes terrain following suitable for aircraft that are flying at altitudes of 60 meters or more. For very accurate terrain following at lower altitudes it is recommended to use a downward facing Lidar or Sonar. When planning missions containing commands with different altitudes-above-terrain keep in mind that the vehicle’s altitude-above-terrain will gradually change between the waypoints. I.e. it will not immediately climb or descend to the new target altitude-above-terrain as it starts towards the next waypoint. In practice it is best to set the initial take-off command’s altitude high enough to clear obstacles.